"We love coming to Wellsboro and playing at Tyoga Country Club. It's been our tradition for 14 years and we look forward to our time here each year. Learn about our incredible membership options and swing by for a tour our facilities! Come enjoy a scenic round of golf at Tyoga Country Club. 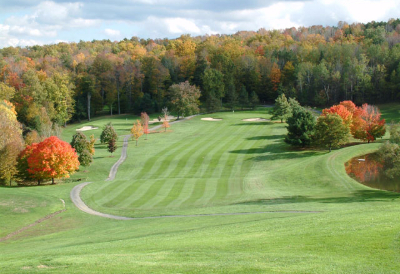 Tyoga Country Club is the premiere golf course in Tioga County, Pennsylvania. Golf Digest has given this beautiful, scenic course four stars. Tyoga is located on Pine Creek Road, only two miles from the center of Historic Wellsboro. This course was designed by Edmund Ault, Ltd., and it uses the all-natural terrain to create some of the best views in the state. Tyoga is a serene, uncrowded course in the rolling Grand Canyon Country. It's hard not to fall in love. Each hole at Tyoga Country Club has its own unique style. This is truly a layout that demands creativity and skill, all while allowing golfers an opportunity to enjoy the picturesque views. This is a fully irrigated course that is always kept in exceptional condition. This design is a serious challenge for a lower handicap golfer without being too overwhelming for a novice. The greens and fairways are well-groomed and manicured. Check out the wonderful article done by Mountain Home Magazine on Tyoga Country Club. Tyoga Country Club is open to guests, and we have several different packages available. Visitors are invited to lunch and dinner at our historic clubhouse, and the restaurant offers a fully-stocked bar. We have outdoor dining on our porch and patio, the perfect places for a drink after your round. "I've been a member at Tyoga for 12 years and it is still my favorite place to come each week. The staff is warm and welcoming and the golf is great." - Gary L.